By Vadim Drouzinin: It’s the fight that all UFC fans had been looking forward to in recent months and as expected has been hyped to the max by the UFC’s deep-pocketed media department, especially with the don of hype Conor McGregor on the lineup as the main event. Unfortunately for Conor McGregor, the pre-fight antics of the bus attack and usual verbal onslaught at the numerous press conferences simply didn’t have the desired effect on the cool-headed Khabib “The Eagle” Nurmagomedov. 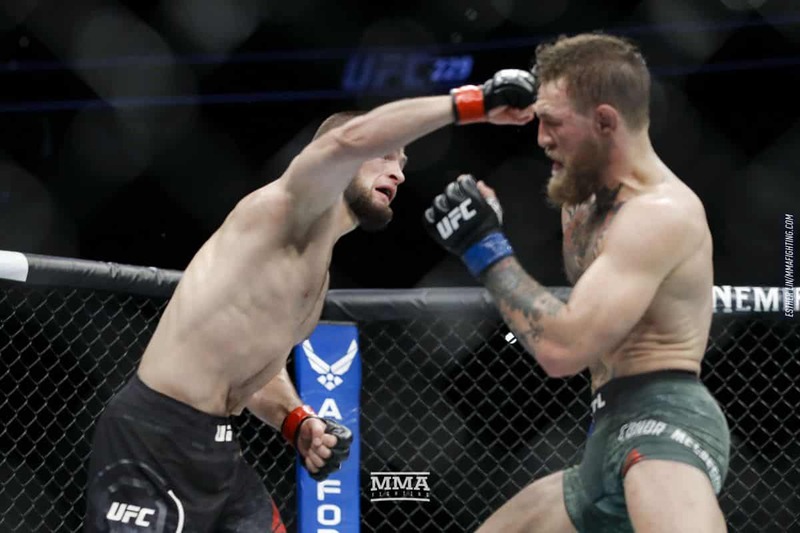 No one will argue that the Irishman is unmatched in stirring up emotions in his opponents and that psychological warfare is a major part of the fast-talking Dublin fighters weapons, and one reason that he is so popular, but the self-proclaimed King of the UFC lightweight divisions came up against a very different breed of opponent. 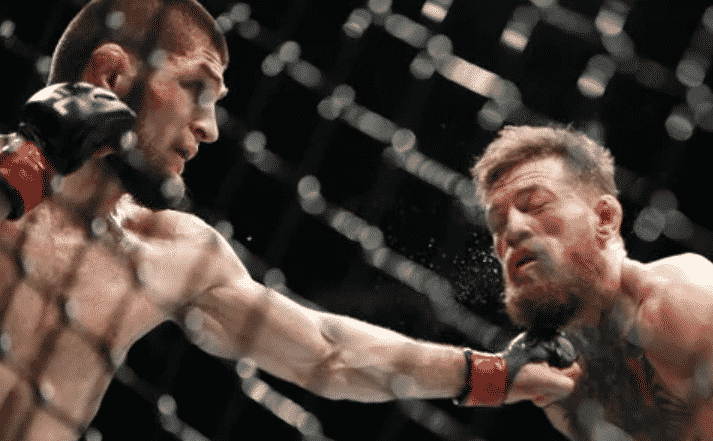 The fighter from Dagestan simply wasn’t phased by these antics, he was simply biding his time to fight night to let his skills do the talking in the UFC octagon and Khabib didn’t disappoint. Two years out of the MMA didn’t do Conor McGregor any favours and he looked uncomfortable from the moment the bell sounded for round one. McGregor did well defending Khabib’s attempts to get him to the floor in the first minute and then the Russian started showing off his apparelled grappling skills completely overpowering his opponent. McGregor simply didn’t have an answer to Khabib’s fine-tuned ground combat skills, being dominated and made to eat not only canvas but a serious barrage of punches and elbows. Khabib continued to control the fight using wrestling to grind down and exhaust his opponent, wearing the Irish fighter down. Round 2 started off more to McGregor’s liking with the two fighters standing toe-to-toe and Khabib caught McGregor with a cracking right hook sending him sprawling to the floor before retaking the mounted position and dishing out the punishment. It was clear for all to see that the Russian fighter was in complete control during the whole fight and kept true to his promise that he would “smash McGregor’s face in.” Round 3 started off with both fighters initially traded punches, knees, uppercuts and elbows in the center of the ring, both dishing out a fair deal of punishment to each other. At the start of the 4th Championship Round it looked as though the fight was starting to turn to favour Mcgregor’s standing fighting style. 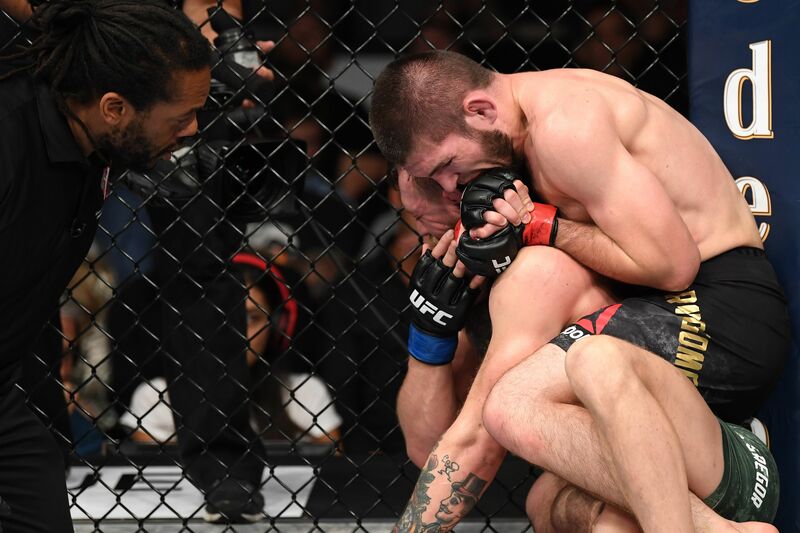 However, Khabib took the ground the canvas with his grappling skills taking the full mount position, grounding and pounding his opponent until he moved into a rear-naked choke, forcing McGregor to tap out and concede to his more powerful Russian opponent, proving to the UFC that he is the undisputed Lightweight Champion. Unfortunately, UFC 229 may be remembered for all the wrong reasons as a brawl broke out in the crowd with Khabib jumping into the audience to confront the McGregor training camp causing all types of chaos, which also spilled over into the ring with McGregor getting hit by one of Khabib’s camp. All the commotion resulted in the undisputed Lightweight Champion not being allowed to raise his belt at the end of the match, which is a shame as it was well deserved. Khabib has 2 UFC records to his name with a spotless fight record of 27-0, as well as an 8 fight winning streak, more than justifying his position at the top of the MMA. Will we see a rematch between the two fighters is anyone’s guess, but giving the open hatred shown between the two fighters and fight UFC fan’s undoubtedly wanting to see if McGregor can make a comeback. I am sure Dana White will try to get something arranged as it will be another money earner for all those involved. However, with 3 members from Khabib’s camp under arrest for assault, the Nevada fighting commission investigating the post-match shenanigans to see whether Khabib is fined or worse denied his title all remain to be seen. Let’s not forget that Khabib is Russian and needs a visa to enter the United States to fight, so if this is turned into a political fiasco then it might not end well for The Eagle. But let’s hope that it doesn’t come to this and we see both fighters in the ring sometime in 2019.